The duplex apartment of 130 m2 is in a wooden chalet larch massif, in a condominium of 3 lots with separate entrance. It has lots of charm and a very neat interior. The rooms are distributed as follows: Entrance porch bay window serving the independent entrance to housing and ski storage. On the ground floor: entrance, a bedroom with a bed of 160 cm and a shower room, a large living room including the living room with balcony, dining room, a kitchen and a storeroom and a toilet independent. Upstairs, 3 bedrooms with beds of 160 cm (including 1 bedroom with 2 beds 160 cm (with its shower room), a mezzanine bedroom above the dining room), a 3rd bedroom, an office , a bathroom, a toilet and a reading corner with TV. The rental includes household linen, one hour of housework a day on weekdays, and wood for the fireplace. A large bath with a 90 / 90cm shower area and shower screen. 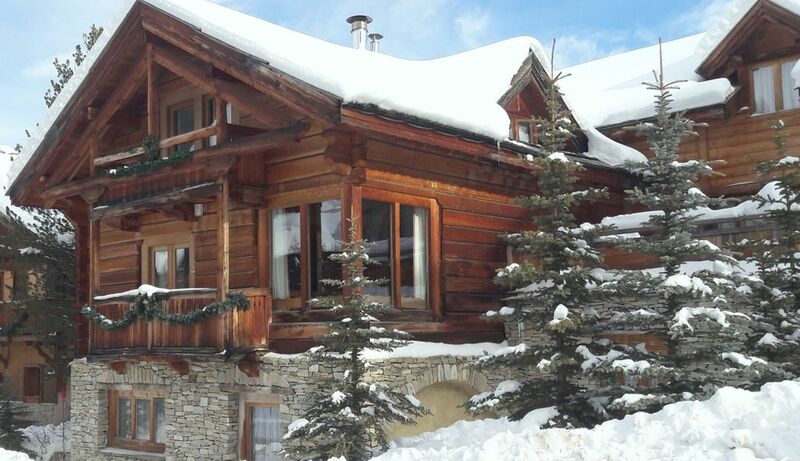 The chalet is located at the top of the Vars-les-Claux resort, at the intersection of Cours Guy Seradour and Le Fournet alley, opposite the Village Club du Soleil and the Sherpa supermarket. Access to the slopes is either 20 meters on the square in front of the entrance to the cottage, and the chairlift Fontbonne (access to the slopes of Peynier) After having crossed the road 50 meters access is next to Club Sun Village and allows you to get to the Tourist Office.